album got his wish. Dickey has been quoted as calling it the best show they ever played. turning to dust with the memories. someone who was lucky enough to be there, in the right time, at the right place. listened to music, hung out with friends who made music. concerts as often as our limited budgets could stand. around, playing tapes, singing along, journeying to Deepest Darkest New York City! of course a total stranger. We must have driven them crazy wondering who we were! guys, naked in a stream . . . cool! The needle swung over and landed on the first cut . . .
pipes! Not that skinny guy on the album cover? Where’s he hidin’ that voice?! and we got to see them five times in my senior year. the things they were playing right there in front of us. So, did I mention that I really liked the Allman Brothers?! a few thousand people. There was a balcony and three sections of theater-style seats. healthy food and junk food: brownies, apples, carrots, cookies, you name it. evidence that the cigarette lighters were winning the battle with the ushers. money filling a 20,000 seat amphitheater. York’s standards. But traveling in a group of five or six, we were probably relatively safe. all trying to look like they lived in the East Village. closing it down hittin’ the note. going straight from school—to church! was recruited at the last minute. shades . . . a ratty hat . . . and I was ready to go to my graduation! liberating, letting everyone know that I was making the rules now! Let’s hear a rebel yell! Since we had reserved seats, there was no giant rush to be first in line for the late show. Fillmore East for the very last time. would be standing right in front of us in a couple of hours! What great seats! November that year, a few short weeks after Duane’s motorcycle accident. over the stage it felt like the Allmans show had started at long last. magic were in the air. stage . . . a couple of riffs on the drums . . . then a spine tingling shot from a slide guitar . were going to make our last show at the Fillmore a night to remember. usually serious expressions would change to broad grins. Yessss! Statesboro Blues and ended with a jam! Duane’s solos were dominant. Dickey’s were shorter but always riveting and poignant. demonstration of musical foreplay that put Bolero to shame. traded searing solos that sent the crowd into a frenzy. striking the rotating mirror ball and sending splinters of light dancing around the hall. on 6/27/71, would reveal just how highly he valued this band of Southern musicians. they’ve heard the best there is to hear. break while everyone else heads out for a smoke?! cymbals and snares slowed to a steady pace, and suddenly there was Berry again. Coochie Man,” made me wish he had been given the spotlight a little more often. needed was a singer so he called Gregg, and that did it. I mean it started with jammin’ . .
maybe . . . .
faces, and drove quietly home. “Mostly, I remember the next night [June 27]. I hadn’t really met Bill Graham at that time. tape made off the air, and always preferred listening to it over the Fillmore East album. listen to that show once more. Wow, what can I say. That album has always been my favorite and Duane Allman is in my opinion, one of the greatest. Live at A&R Studios is the best I’ve heard period Duane Allman said to his bandmates make it Goodfellas were only here for 1 hour. Nice read. I came to the brothers after Duane & Barry died. Sort of fell away until Derek started playing with them and worked my way backwards. I was just 11 in 71 but I wish to God I’d have paid closer attention. I always wonder how it must have felt to be at one of those show. You just gave me a really good idea. Thank you. Mr. Archer, your essay is perfect. ThankYou. I and so many others are able to be at Fillmore with your words. The music of The Allman Brothers is my life movie soundtrack. Past, present, and eternity. ThankYou again for letting me hand out stickers at the Gregg Allman show at Memphis Botanic Garden in June. Excellent evenin. My name is Dan DeMers from the heart of the Hudson Valley, and a proud 3rd generation ironworker out of local 40 N.Y. city one of my fellow I.W buddies with his long blonde hair looks much like Gregg Allman. After u made me feel like i was at this concert i loved the article i shared it with him cause he’s a fanatical fan of the Brothers, so again i thankyou and am sure my friend and fellow worker Kevin Joyce will be happy i stumbled on it also.Hats off to a GREAT MEMORY!!!! In ’69,while on summer vacation from school(I was 15),The Allman Brothers Band played on 2 consecutive weekends at the Melbourne Auditorium in Melbourne,Fl. 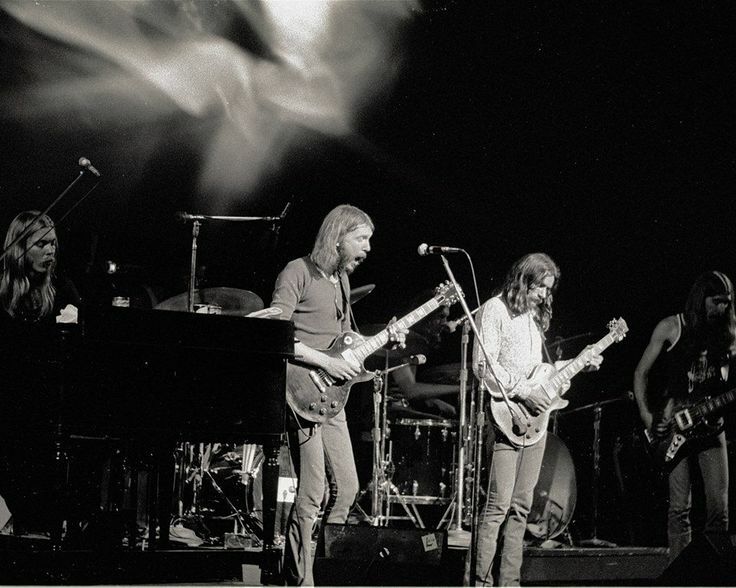 I was a 3rd year guitar student and knew of Duane Allman being a BUSY session player,and I wasn’t about to pass up a chance to witness a master at work!A friend and I made plans to go the second show.We were in need of a ride,so my friend’s older sister(who had their first album)agreed to transport us to the show.We arrive just as the support act begins.They were a trio (guitar,drums,keyboard w/keyboard bass).Next thing we know,out comes Berry Oakley to sit in with them!He fattened up their thin sound nicely. Then it was time for the main course!Now,I had never known about “slide guitar” before,and when Duane started playing,I couldn’t believe what I was both seeing and hearing!My jaw almost made a dent in the floor!That room had great acoustics and the sound was so good that it was almost like the album itself was being played through the P.A.!!! It could not have been better. As it turned out,my friend’s sister brought her copy of the first album with her.After the show,we’re standing around when I look across the room and spot Gregg walking out from backstage.I grab the album and approach him and he graciously signs it. My friend had brought a camera,so we try to get backstage and actually make it! We can’t find Duane,but there’s Dickey Betts,sitting on a folding chair pickin’ on his SG. We get some shots of him including one of me playing his SG!!! This was definitely one of my better concert experiences! That June 26th late show is, to my way of thinking, the holy grail of rock-n-roll. Surely the tape(s) must be somewhere; right? If they somehow were misplaced and still reside any place in the material world, please, dear God, PLEASE, we implore you, we beseech you, we appeal to you and all you and we both hold dear, and I understand that isn’t always the same thing, but still … that you somehow maneuver events, circumstances, people who may not even know what it is that they know regarding this to search, act, inquire into its whereabouts in order that it can somehow be unearthed and restored to its proper place amongst we the people! The boys gave this most beloved of musical theaters’ a closing show worthy of its stature. It’s now well past time for this closing night’s performance to surface for one and all to hear. That it remains missing to this day, that it somehow slipped between our fingers and out of our musically craving hands leaves us all diminished — and yes, still grieving — for its return to its proper place: inspiring us all with its majesty, soul, and passion. Whoever you are and wherever you may be found, if you have any information relating to or even a clue regarding where these tapes may reside or even may have resided in the past, we request you in the name of humanity and all that is fine & good within it still, albeit we agree to disagree on exactly what that may or may not be, to help find, unearth, restore, and release this seminal musical event for all to hear and be inspired by. Remember: the musical soul you save may very well be your own! Thanks for sharing your memories of this most significant of musical evenings with us, Rowland. Like the show itself, I never wanted it to end. 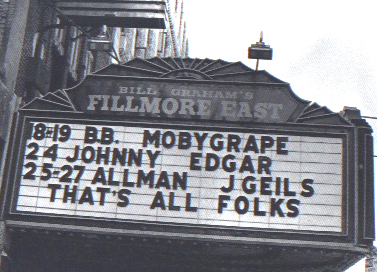 Bill Graham’s Fillmore East LIVES!!! Long live the Allman Brothers Band!! !